The 73 metre (239’) motor yacht Vicky will be available for charter from May 2016 for the first time since her delivery in 2012 through West Nautical. She collected three coveted Neptune trophies at the 2013 Showboats Design Awards and World Superyacht Awards, demonstrating how highly her peers think of her. Built by Turkey’s Turquoise Yachts with exterior and interior design by H2 Yacht Design, she accommodates 12 guests in seven generous cabins including a master suite on the upper deck with port and starboard sea terraces, two VIP cabins, two doubles and two twins on the main deck, all with entertainment centres and en suite bathroom facilities. Fully refitted in 2014 with a complete new paint job, Vicky is being launched onto the charter market in immaculate condition and she is also listed for sale. Her main deck saloon features an elegant lounge area equipped with a grand piano and a separate formal dining area, positioned next to a tropical fish tank, forming a superb entertaining area that combines a sense of warmth and comfort in a chic design. The upper deck lounge includes a cinema with relaxed seating and a large screen. A well equipped gym and fitness studio with a running machine, cross trainer, free weights and bench as well as yoga mats are designed for mental relaxation and physical stimulation. As would be expected, she carries a huge range of water toys including no fewer than four tenders along with jet skis, snorkeling gear and a variety of towables. 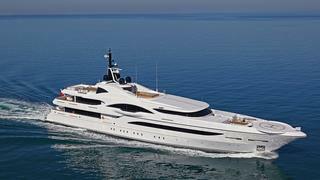 Vicky is available for charter in the Mediterranean this summer at rates starting from €550,000 per week.